While the US decided to lift its arms embargo against Vietnam despite protests of the human rights activists, Vietnam’s stake in the deal appears far lower, as the country seeks to cooperate with all countries in the region and avoid overdependence on any single player. The full lift of the US arms embargo can hardly shift Vietnam's weapon imports from Russia to the US. President Obama's announcement was arguably more symbolic than concrete. It should be remembered, that the US arms embargo was partially lifted a few years ago, and we did not see that Hanoi took advantage of this and made any significant purchases of the available American weapons. The same will happen in the foreseeable future. Vietnam has already commitments to purchase Russian weapons and it will take time until they all will be delivered. At the same time, Vietnamese military officials are rather cautious about interoperability costs of using different weapon systems. If Vietnam is going to start purchasing US weapons, it also needs retraining military personnel on the use and maintenance of US weapons. This is not only expensive and time-consuming, but may affect operational performance in the field. The US decision to lift embargo is a part of strategy to contain China. If this was purely aimed to strengthen ties with Vietnam, why President Obama waited so long until the final months of his administration to make that visit, especially when he regularly paid visits to the region in the framework the US rebalance policy in Asia. In other words, Obama could have easily made a stopover in Vietnam during his previous trips to the Southeast Asia, but surprisingly never did it, until now. The US and Vietnam seem to be some strange 'bedfellows.' On the one hand, you have the US, which portrays itself as the leader of the free world, a defender of democracy and human rights, and on the other hand, you have Vietnam which is still a one-party Communist state with a questionable human rights record. It naturally leads us to wonder whether the threat from China has brought these two polar opposites together. The impact on the situation in the South China Sea will sufficiently depend on whether Washington and Hanoi decide to fully utilize the US arms embargo lift. We might expect some initial reaction from Beijing, which appears to be on edge with the upcoming Permanent Court of Arbitration decision regarding the case brought by the Philippines over the South China Sea. But I don't think it will go beyond some kind of diplomatic protest. The decision was a signal to Beijing, but it could only force China to react strongly if some concrete measures are taken by Hanoi and Washington. 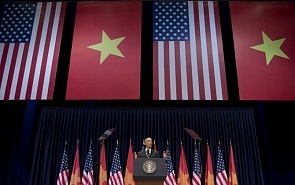 The US decision should not alter Vietnam's foreign policy too much. Hanoi became closer to the US since the normalization of ties in 1995, and last year the two countries celebrated 20th Anniversary of normalized ties. It could be wrong to interpret Vietnam's policy as moving closer into the US 'camp'. Despite tensions with Beijing, Vietnam is still a founding member of China's AIIIB initiative. While it joined the US-led Trans-Pacific Partnership (TPP), Vietnam is also a member of the ASEAN-led Regional Comprehensive Economic Partnership (RCEP), which includes China. As to Vietnam's internal situation, the genuinely warm reception that President Obama received from the Vietnamese public, surely did not go unnoticed by the Vietnamese officials.